The 2016 Republican presidential primary race has not been going as expected for former Florida governor Jeb Bush, from plummeting poll numbers, to a poor showing in the Iowa caucuses, to several lackluster debate performances. 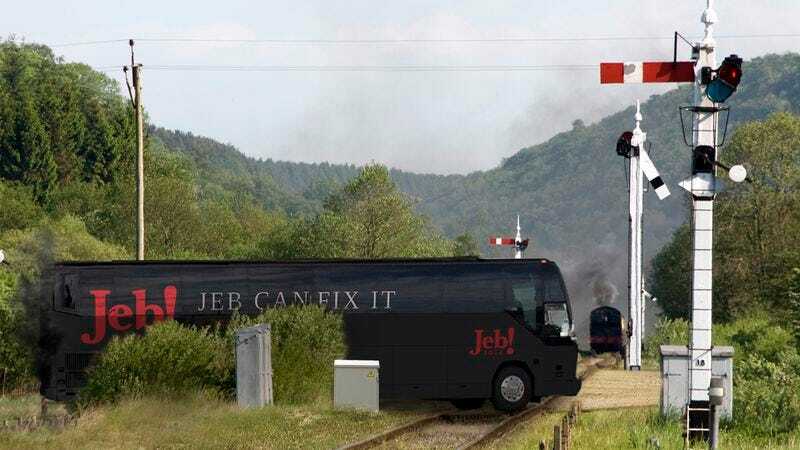 And with the New Hampshire primary in full swing, the latest news out of the Bush camp adds to that list of woes: Jeb Bush’s campaign bus broke down on a train track, and a train is rapidly approaching. Six months ago, if you had predicted that Jeb Bush would be in fifth place nationally and sitting helplessly on train tracks in his campaign bus, turning the ignition over and over while yelling “Come on! Come on!” as a freight train barreled down on him, most pundits would have said you were crazy. But the former presumptive frontrunner is indeed in dire straits today, as even his repeated honking of the bus’s horn hasn’t slowed the approach of the train. To make matters worse, Jeb’s competitors continue to shine. Ted Cruz earned a victory in the Iowa caucuses, while Donald Trump is leading polls in New Hampshire and is not currently stuck on train tracks with a 120-car freight train just 30 seconds away from smashing his bus into complete oblivion. In a campaign dominated by political outsiders and an upending of conventional thinking, Jeb Bush’s $150 million in fundraising has done little to sway public opinion or get his stalled bus out of the way of 180,000 pounds of crushing force created by a AC4400CW locomotive. Can Jeb recover from this latest setback in time for tonight’s polls? Back in August, it seemed easy to imagine Jeb putting the bus in neutral, then gathering his whole campaign staff to try to push it across the tracks seconds before the train would have sent them all to kingdom come. But today, such a recovery is hard to envision for the struggling campaign. If he can’t rebound from this train-track debacle, Bush’s White House bid may end even before Super Tuesday.